22 April 2010, at 7:09p.m. US - A Virginia Tech animal scientist, who in 1957 began breeding lines of White Plymouth Rock chickens based on their juvenile body weight, has provided scientists around the world with a model for exploring the molecular basis of traits like growth and reproduction – traits that moulded the red jungle fowl into a farm animal roughly 8,000 years ago. Paul Siegel, University Distinguished Professor Emeritus of Animal and Poultry Sciences in the College of Agriculture and Life Sciences, co-authored an article in the March 25 issue of the scientific journal, Nature, that uses data from his decades-long poultry selection project. The article, 'Whole-genome resequencing reveals loci under selection during chicken domestication', highlights research at Uppsala University in Sweden and the Broad Institute of MIT and Harvard University. Both of these chickens are eight weeks old but from a high-growth line and a low-growth line developed at Virginia Tech. "Throughout my career, I have been interested in studying the relationships between growth, reproduction, and immunology of chickens," said Professor Siegel, who joined the Virginia Tech faculty in 1957. In his first month on the job, Professor Siegel designed an experiment that would create two flocks of a common breed of chickens: a high-growth line and a low-growth line. 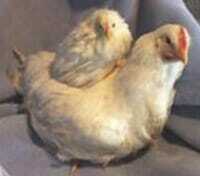 Every year, he bred the heaviest and lightest chickens with others of similar weight. Today, his high-growth chickens are nine times larger than the low-growth ones by the time they reach selection age, even though they both originated from the same flock. "By selecting for growth, we are testing the genetic and immunological limits of poultry," Professor Siegel explained. In 2004, scientists completed the genome sequence of the red jungle fowl – the same species as the domestic chicken. Researchers throughout the world began to search for genetic markers that determine specific traits in broilers, layers and red jungle fowl. This research has led to factors that have affected the chicken genome through domestication. In addition to scanning the genetic information of common breeds of poultry, researchers looked at the extreme cases of the high- and low-growth chickens at Virginia Tech. According to Professor Siegel, the decades of poultry breeding complete the recent advances in genome sequencing technology. "The question becomes, 'Now that we have the technology, do we have the populations to support the use of the technology?'" Professor Siegel said. "The answer is 'yes'. Not only do we at Virginia Tech have a population, we have the complete pedigree for 53 generations." The research team identified a gene found in all of Virginia Tech's high-growth chickens but few of the low-growth ones that appears to regulate appetite – a finding that could have ramifications for both animal and human health studies involving weight. Previous research has shown that appetite, in addition to metabolism, plays a significant role in weight gain or loss in poultry. The team is also investigating a gene that encodes the thyroid-stimulating hormone receptor protein to determine whether domestication altered the genetic make-up of chickens thousands of years ago. If true, this would be the first time that scientists have identified a mutation in animals caused by domestication. - You can view the full article by Professor Siegel in Nature by clicking here.